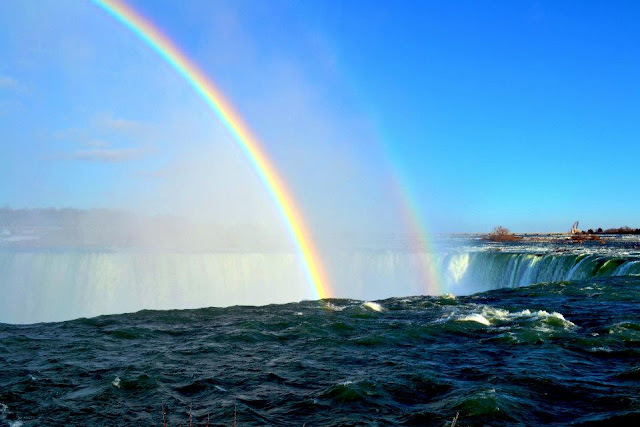 it was a beautiful sunny day, and the brightness illuminated the fine mist in the air caused by the wooshing falls, resulting in two vibrant rainbows that seemed to be shooting right out of the churning water down below. 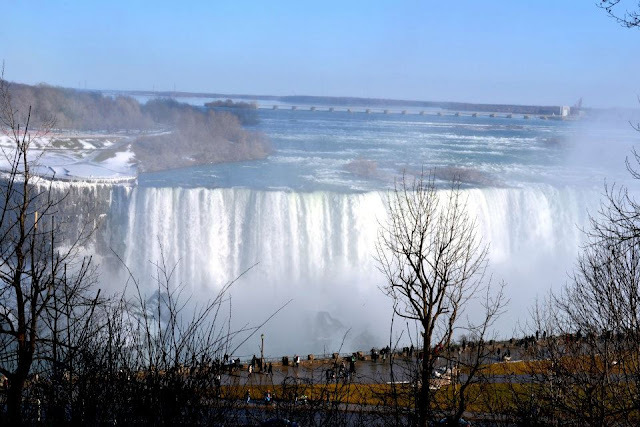 As we gazed at the incredible sight of thousands of gallons of water overflowing with unstoppable force, the wind changed and the mist fell down on us (and dozens of other surprised tourists) like a heavy rain! we ran inside to take shelter, and enjoyed watching the thundering falls from a safe distance (and behind panes of glass) while enjoying delicious coffee and tea at the table rock restaurant. ...it was an impromptu getaway. i'd already booked the time off, because this week is paul's reading week, and monday was a holiday, so i'd taken two extra days to spend with him. 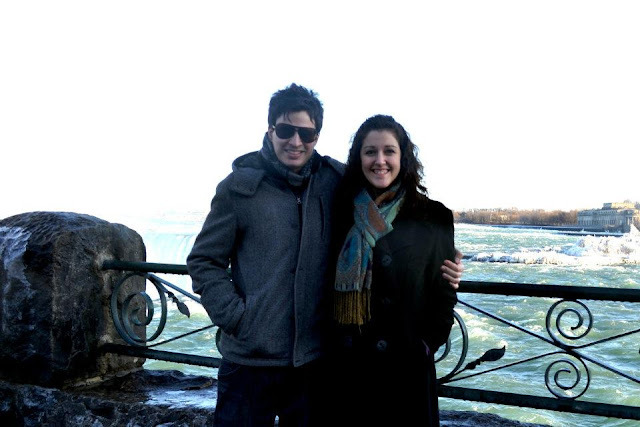 we weren't planning to go anywhere (living in our lovely apartment in downtown toronto usually provides enough entertainment when we want to go out, and unlimited movies and boardgames, when we want to stay in) but when i found a great deal on a hotel in niagara falls, an hour and a half from home, we thought a mini-getaway would be the perfect thing to cure the winter blues. so we made the quick trip to one of nature's most breathtaking sights on monday afternoon. after we'd dried off a little, we headed back to our hotel to fill up our enormous jetted tub and warm up before dinner. the rest of the weekend was a blur of delicious food, tested luck at the casino, conversations full of laughter, and running through an impromptu snowstorm... but mostly, large amounts of relaxation. I love these pictures. And, I loved the falls. One day, I will go back! So beautiful! I haven't been there in years but I'd love to go back!